Steal this Idea: Chicago street cleans the air! 1. Bike lanes adjacent to parking lane; 2. Bike rack; 3. Bioswale planter (removes silt and pollution from surface runoff; 4. Solar bus shelter; 5. White light lamp (40% more energy efficient); 6. 100% post-consumer recycled content used for sub-pavement levels; 7. Light-colored pavement (39% of hardscape is reflective pavement); 8. Reflective pavement to mitigate urban heat island effect; 9. Pervious parking and bike lanes with detention area made from recycled materialsIn October, the Chicago Department of Transportation (CDOT) unveiled the first phase of their “greenest street in America” project. Located on a 1.5-mile stretch of Cermak Road in Chicago’s Pilsen neighborhood, the street is made with air pollution-eating materials and features solar panels, native plants and stormwater-sucking pavement, among other impressive technology. The street’s success has since launched the city into the national limelight for innovative planning. Of course we’re happy for Chicago, but it leaves us wanting to know — who in Philadelphia will steal this idea? So what makes Cermak Road the greenest street in America? First, the materials used are sci-fi caliber in their innovation. According to CDOT, this is the first commercial roadway application of photocatalytic cement. Imagine putting the air-cleaning power of a little pine forest into a road surface — the cement’s nanotechnology absorbs nitrogen oxide (i.e. car exhaust) from the air and cleans the road’s surface through a sunlight-powered reaction. The process uses titanium dioxide, so it’s not all roses — mining and chemical processing are needed to get titanium dioxide — but it’s a great application of the pigment. The sidewalk concrete uses more than 30 percent recycled content, and the cement’s reflectivity reduces the urban heat island effect. Then there are the water and energy conservation benefits. 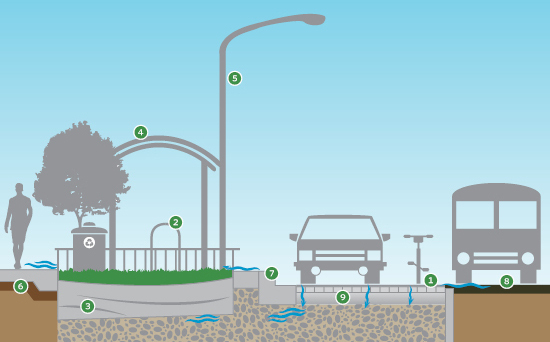 The street diverts close to 80 percent of rainfall from the sewer system through permeable surfaces, rain gardens and street trees. As a result of the excellent stormwater management, there’s no need for potable irrigation water. And guess how they’re powering streetlights? A wind and solar-powered lighting system with LEDs! Add to these environmental benefits a half-mile of bike lanes and features to keep pedestrians safe, including a pedestrian refuge island — which separates crossing pedestrians from motor vehicles — and curb-corner extensions — which allocates more street space to pedestrians. CDOT also created educational signage and a walking tour brochure. Of course the greenest street in America comes with a hefty price tag: close to $14 million for the mile-and-a-half-project. Funding came from Tax Increment Financing and assorted grants from the Federal Highway Administration, Illinois Environmental Protection Agency, and Midwest Generation. Nice work, Chicago. We’re jealous. While we’re already improving our streets in a variety of ways, including a growing bike lane network, TreePhilly’s seasonal tree giveaways, and the Philadelphia Water Department’s innovative Soak It Up! design competition for stormwater management, we want someone in Philadelphia to steal this idea. (We’re talking to you, Streets Department, Mayor’s Office of Transportation and Utilities, and the Mayor’s Office of Sustainability.) The street doesn’t have to be “the greenest in America,” but we’d be happy to settle for some air-cleaning cement on Spring Garden. Jenn Rezeli is co-founder and managing principal at Re:Vision Architecture (revisionarch.com).